Captain Ds Hush Puppies have been a long requested recipe. Now you can recreate this Captain Ds menu item at home with this copycat recipe. Captain Ds is one of my guilty pleasures. There is just something about fried fish that is so hard to resist. I love Captain Ds. It is one of my favorite fried fish places to frequent. Captain Ds Batter Dipped Fish is simply scrumptious, crunchy on the outside, and the fish is cooked perfectly on the inside. So we might as well continue to round out that lovely combo plate with the addition of their hush puppies. Homemade hush puppies are very easy to make if you are making batter-dipped fish, why not fry up a few hush puppies. The ingredients are super common, so you won’t have to run out to the grocery store to get the ingredients that you need for this recipe. You may need to get some self-rising cornmeal; I thought it gave the best results when making the hush puppies. I sometimes prefer to buy self-rising cornmeal instead of making it from scratch, for me, it rises more, and that is what I want in this recipe. No one likes hush puppies that are hard and could be used as a weapon against badly behaved dinner guests. Sometimes people ask me what type of oil should they used when they fry. I honestly use plain vegetable oil. Often this is soybean oil. The brand I usually buy is Kirkland from Costco. You could use peanut oil, or corn oil, it is up to you, but when I weigh out expense versus results, plain vegetable oil works for me when frying. I will suggest that you cook at 350 degrees. You may want to use a deep fryer like my T-Fal Fryer it works great. I love this fryer because I can filter the oil and use it again. It makes cleaning a snap too. 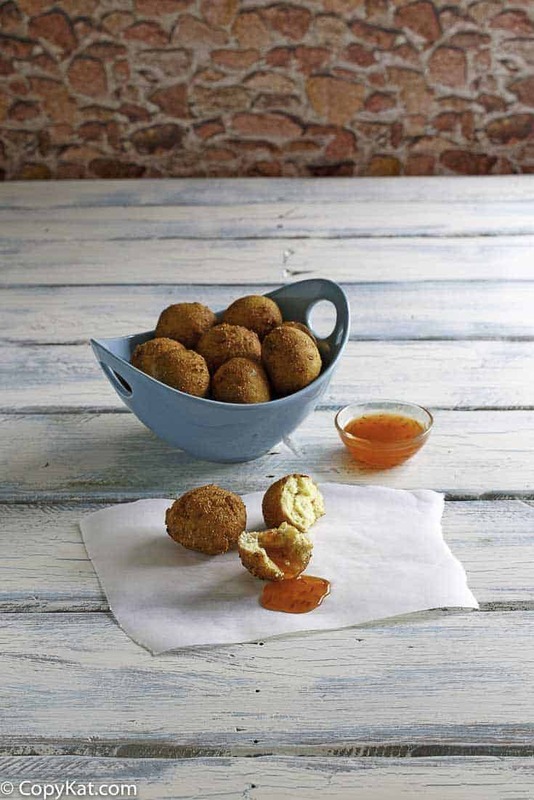 You might wonder what you would serve your hush puppies with, you don’t have to serve them with anything. You can use some sweet chili sauce if you like. Captain Ds has a wonderful sweet chili sauce that is much like the sweet chili sauce you will find in the Asian section of your grocery store. I hope you give this recipe a try. If you love Captain Ds you might want to try the Captain Ds Cole Slaw recipe on my blog as well. 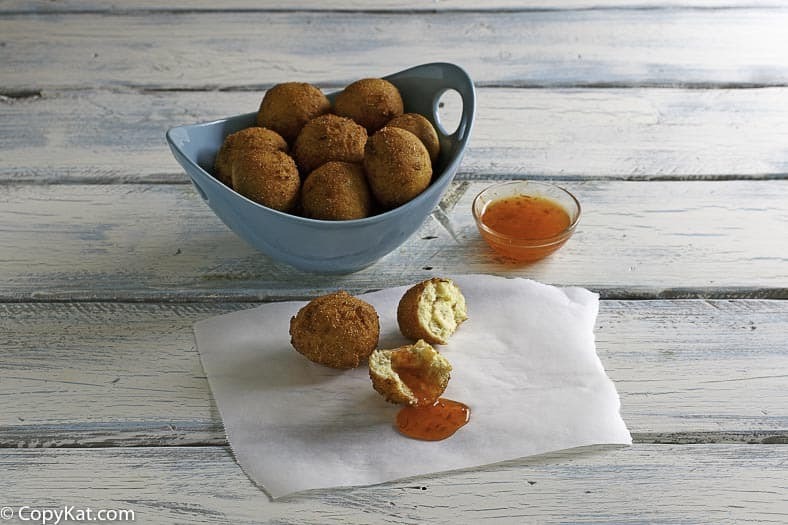 You can make Captain Ds Hush Puppies at home. Heat oil to 350 degrees. Make certain to add enough oil, so the depth is 3 to 4 inches. 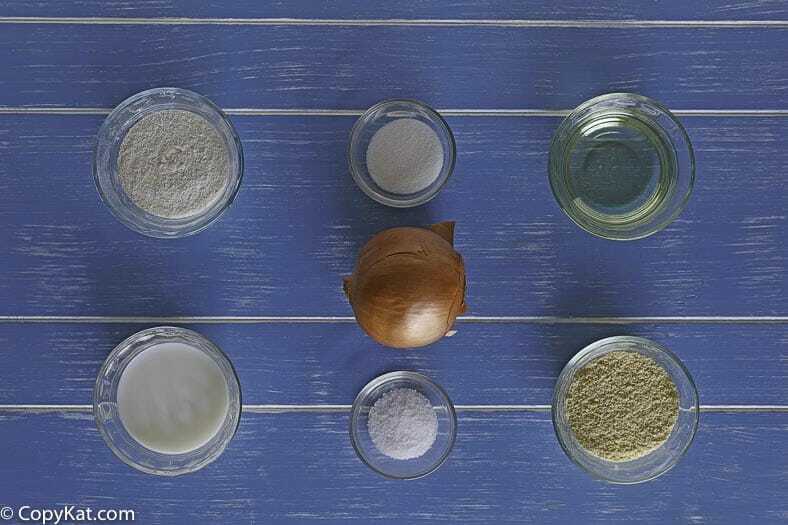 In a medium bowl, stir together the white cornmeal mix, yellow cornmeal, buttermilk, sugar, diced onion, and salt. Drop by a 1-ounce cookie scoop into the hot oil. Fry for 1 to 2 minutes. Fry only a few at a time for best results. If you add too many at once, the oil temperature may drop, and they make not cook well. Drain on a wire rack. I ate at a brand new Captain D’s a couple of weeks ago, actually on their second day after opening. The first thing I noticed about the hush puppies was that they were SOFT on the outside, not crunchy. And they were delicious. I assumed they had a special way of cooking them. Are they not the same in their other restaurants? Every recipe I see, copycat or otherwise, says hush puppies should be crunchy on the outside, soft on the inside. And most copycat recipes I’ve seen are questionable at best and not the true recipe from inside the kitchen of the actual restaurant. They’re actually just a regular recipe with a restaurant’s name attached to it. Interesting, I wonder if the location you visited does something different to theirs. My location fries them, they aren’t too hard on the outside, but I am not 100% of what you mean when you say soft. I hope you enjoyed these! Haven’t tried your Capt D’s Hush puppies recipe but will uptempo on tomorrow!! Thx for your site, looks great! Oh great, I hope you enjoy them. I made this recipe exactly like the instructions said and these hushpuppies are horrible!! They don’t taste like normal hushpuppies and have a completely different texture. This recipe needs flour and less cornmeal. I am really sorry this recipe didn’t work out for you. Thank you, thank you. I have been looking for this recipe for so long! Can’t wait to try it. I’ve tried many recipes but they are all dry inside. Hoping this one is moist inside. I cant wait to try the Hush Puppies recipe. I have a special request, if you dont mind. One of my all time favorite appetizers was potato skins from a local restaurant which has since closed. Ive tried to recreate the recipe but Ive only managed to waste my time and alot of potatoes. Do you have a never fail recipe you could share, please. Thank you for your note. Can you tell me what made these so special? I love hush puppies & always make them when serving fish. My brother in law is from South Carolina and he first showed me how to make them southern goodies. I haves lived on the other side of the Mississippi so had not tried them before. Needless to say, I loved them and still do. Stephanie, I absolutely love your Web Site! All of your recipes are spot on! I will be making the hush puppies soon…along with the fried perch I caught last spting!! I have a request. Do you have the method for making KFC chicken pot pie? I just love that pie…so homey and Comforting! I assume the crust is puff paste. Thank you for reading my note. Have a wonderful Memorial Day wknd. Stay Fab!, ???? Thank you for your note. I am sorry I haven’t tried this recipe before. I would need to try it before I know how to fix this one. I will keep it in mind! Now if you could duplicate Captain D’s tartar sauce recipe. Tartar Sauce is so easy to make. Mayonnaise, Pickle relish (you can use dill or sweet), lemon juice (ReaLemon), a little salt and black pepper, garlic powder (and I have added some chopped garlic). I have put a little Emeril Essence in it. I cannot tell you a specific amount because I am a eyeball and taste cook.LOL By the way this is my own concoction. (I have put a little prepared mustard but not much). I cannot say it is a copykat of Captain D’s but my family doesn’t want store bought anymore. I have several tartar sauce recipes online, but I still haven’t managed to work out this one. I love this place. I like mine. A really good mayo like Hellman’s or Duke’s. Lots of diced onions, lots of chopped dill pickles or dill relish and some pickle juice. Love the site thanks for all the recipes??? ?All super tastey.